When designers think of signal processing for devices at the sensor edge of a network, they invariably gravitate to a digital processor, such as a microcontroller (MCU) or a digital signal processor (DSP). This tendency is natural since the last three decades have seen significant innovations, as well as regular incremental improvements in power and size, for digital processing—all of which paved the way from large mainframe computers to powerful handheld devices that consumers carry daily. But with the massive growth of sensors and edge devices in the Internet of Things (IoT), system designers face new challenges. In IoT systems, wireless sensors capture and process data over long periods of time, so power consumption (battery life) and data analytics (data overload) are critical. The traditional approach to data is to digitize first, but this approach struggles to meet the IoT power and data challenges. Meanwhile analog has been relegated to non-processing roles, such as sensor conditioning and data transmission. Now, with recent innovations in analog signal processing, the time has come for designers to invest in a combination of analog and digital processing to address the power and data challenges. In today's IoT and embedded sensor devices, the system first digitizes all of the analog sensor data in an analog-to-digital converter (ADC). The system then processes the data in an embedded digital processor to extract relevant information, such as a specific event signature, prior to transmitting the data upstream for further action. This process can be extremely inefficient since all of the data—valuable or not—are digitized by the ADC, which can dominate the system power consumption. This inefficiency is quite dramatic in higher-bandwidth sensor systems such as audio voice systems where the ADC power is significant and where it is also important to analyze all of the sensor data, even though most of the data are not voice. By moving some processing in front of the ADC, an order-of-magnitude reduction in signal chain power consumption can be achieved, because the desired data can be extracted and digitized while the undesired data are discarded. In addition to reducing power consumption, processing earlier in the sensor signal chain also helps to reduce the size and cost of the signal chain componentry, because fewer data need to be processed, stored, and transmitted. In systems with lower-power and higher-bandwidth sensors, the power consumption is typically dominated by the ADC and the digital processor. In these systems, the most effective way to address the power consumption is to reduce the activity of the ADC and digital processor. This is accomplished today by either duty cycling those components—which risks the loss of important data—or by adding an always-on low-power DSP that wakes up the digital processor based upon the signal content—which still incurs the power consumption of an always-on ADC. Since ADC power consumption does not scale nearly as aggressively with the technology node as does the power consumption of digital logic, the ADC will dominate even more of the power consumption in the future. An alternative approach is to reduce the quantity of data that are digitized by performing data analysis in the analog domain. Figure 1 illustrates this concept. The data are analyzed in the analog domain so that fewer data are digitized, thereby better balancing the power budget across the signal chain. The bar plot compares the always-on power breakdown of the two approaches in a "wake-on-voice" application. Fig. 1: Comparison of the dominant power consumers in a traditional sensor system and a sensor system that incorporates an analog processor. Voice activity detection (VAD) offers a good example of how analog processing can significantly reduce system power consumption. In voice-control systems, the first step is to determine whether a voice is heard. Since upwards of 90% of the audio that is detected by the microphone is not voice, the digitize-first approach wastes significant power by digitizing and processing all of the audio (duty cycling is not an option) in search of voice to trigger the next stage of voice control. In contrast, the VAD algorithm can be placed in an analog processor, which generates a wake-on-voice signal to trigger the ADC and DSP to wake up and analyze the voice for keyword or voice command processing. This approach provides a 10x reduction in power as compared to today's leading competitive solutions. Figure 2 shows this, and compares three different VAD systems: Digital Assorted, with VAD performed outside of the microphone, likely in a codec or DSP; Digital Integrated, with VAD performed in a Smart Mic that includes a low-power ADC and DSP; and Analog Integrated, with VAD performed in analog and no ADC or DSP required. Fig. 2: Analog voice detector provides ~10x power reduction. While power consumption is a key challenge facing developers of sensor edge devices, the other big challenge for the broader IoT system is data analysis and data overload. Given the large amount of data ("big data") that are expected to be generated by innumerous sensors/edge nodes, the ability to reduce the data to only the relevant portions at the sensor will provide significant benefits to the entire IoT system. Today, edge devices are typically dumb by necessity because designers cannot afford to compromise the battery life of the device with significant processing. Consequently, these edge devices generate a deluge of irrelevant data that are not filtered until they reach the cloud. Analog processing addresses this data analysis challenge by bringing efficient analysis earlier in the signal chain. Early identification of key data will provide cost advantages at all layers of the IoT stack by enabling each layer to only process and send the relevant data, and will provide performance advantages in back-end data analytics by allowing developers to redirect their focus away from finding relevant data and on to building upon relevant data. Vibration monitoring provides a good example of how analog processing at the edge sensor device can significantly reduce data. In industrial systems, machinery wears down or needs maintenance on a regular yet unpredictable timeframe. In these systems, monitoring the vibration characteristics offers a glimpse into early troubles and allows preventative maintenance. One challenge in vibration monitoring is how to handle the large quantities of vibration data that are generated by the vibration sensors distributed throughout a structure or plant. Vibration data are captured at a moderately high frequency (up to tens of kHz), and thus generate a significant amount of data for an embedded sensing device. This abundance of data requires more powerful processors and greater power consumption. Vibration monitoring devices digitize all of the data and then perform an FFT on the data. Peaks in the FFT spectra indicate the vibrational modes of the monitored structure, and the health of the structure can then be inferred from the relationship between the vibrational modes. Essentially, the desired vibration information is contained within a relatively small number of data points (the modes), so by extracting this information earlier in the signal chain—prior to digitizing the signal—the necessary resources for an embedded vibration monitoring device can be significantly reduced. Extracting these modes with analog processing provides a 100x reduction in the data that must be digitized and handled by the processor: from 2048 data points for an FFT frame to 10 pairs of frequency and magnitude datum. This process is illustrated in figure 3. While data reduction is a key benefit to vibration monitoring applications, it is also expected that analog processing will provide additional benefits to power, size, and costs of the entire solution. Fig. 3: In a vibration monitoring system, analog processing extracts the vibrational modes (i.e. peaks of the spectra) prior to digitization. This reduces the data that must be handled by the ADC and digital processor by 100x. While digital processing has been used in most settings because it is flexible, easy to program, robust to noise, and also benefits from technology scaling, analog processing is able to operate in real-time and perform many computations inherently that require significant overhead in the digital domain (e.g. multiplication and other nonlinear functions). Additionally, a number of recent innovations in analog processing technology have been developed to make analog processing flexible and easy to use. Programmable analog circuity has been in existence for many years, but these recent innovations will accelerate the development of efficient sensor systems using analog processing. 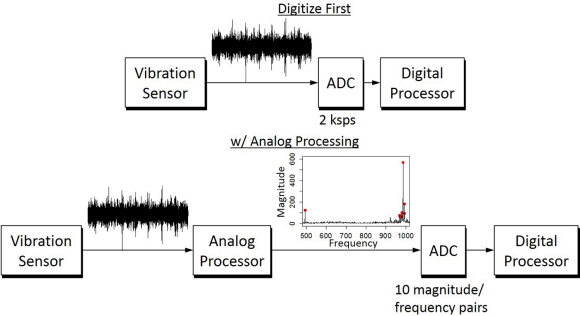 This article used VAD and vibration monitoring to illustrate the sensing applications of analog processing, but analog processing can benefit other sensing applications as well. Additional audio applications beyond VAD include the extraction of audio features—such as background noise statistics—for subsequent digital processing, or providing additional "wake-on-audio" capabilities for applications such as security and surveillance. Beyond audio and vibration monitoring, analog processing can greatly benefit other sensor systems—such as capacitive touch systems, heart rate and biosensing, as well as general programmable sensor conditioning & interfacing. Essentially, any application with low-power sensors and higher data bandwidths will benefit from reduced system power consumption and reduced data requirements, which has the potential to reduce the cost of the system and simplify the design of the end product. What Is LVIT And Where Does It Fit Into The Sensor World?